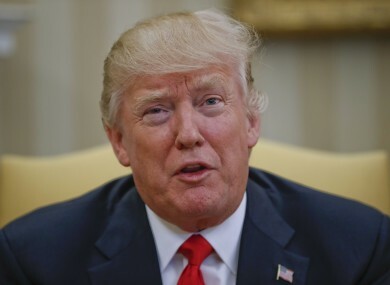 Trump appeals for money from supporters to combat "nasty attacks by fake news media"
In his message, he said that the fake news is “never going to stop”. PRESIDENT DONALD TRUMP has sent an email appeal to his supporters to ask for money to help fight “fake news”. The email came the day after Trump’s White House barred several major US media outlets from a daily press briefing. They included CNN, the BBC and New York Times. Those allowed in included Fox News and Breitbart News. The action raised accusations of favouritism and led to much criticism from the outlets themselves. The White House Correspondents Association said it was “protesting strongly” against the White House decision. Sean Spice defended the stance. In today’s email, which comes from the GOP and bears Trump’s name, the president appeals to supporters to help him “fight back – and fight back hard”. You hear the fake news every single day. It comes from the media, the Left, the out-of-touch Hollywood elites. But here is the real news: They are NEVER going to stop. The mail points out that there are three days left until details have to be filed on Trump’s campaign to the Federal Election Commission. Email “Trump appeals for money from supporters to combat "nasty attacks by fake news media"”. Feedback on “Trump appeals for money from supporters to combat "nasty attacks by fake news media"”.